HydraFW is a native C (and asm) open source firmware for HydraBus board with support of HydraNFC Shield. 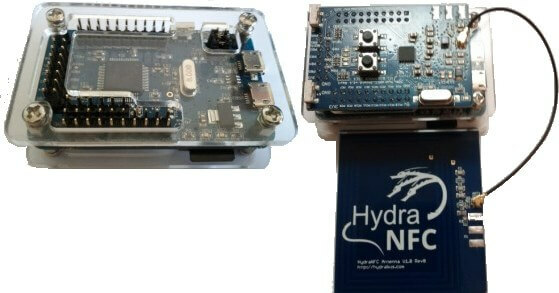 This version is basic and mainly for HydraNFC users waiting sniffer mode for NFC ISO/IEC 14443 Identification cards. The firmware can be installed without recompilation (dfu binary included) by following the 7 steps to flash their HydraBus board. Is it possible to continuously monitor traffic, so let’s say sniff a 10 seconds conversation? Or will this exceed buffer sizes or other limitations and can I only capture a limited number of samples / commands? Anyway there is a 64KB buffer and the sniffer can easily sniff 10s and even more as it sniff only active communication.